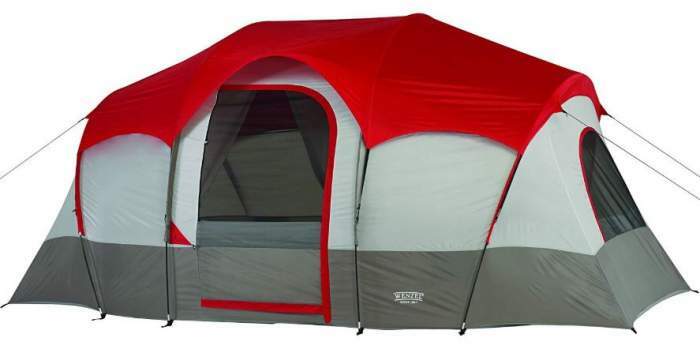 Wenzel Blue Ridge 7 person 2 room tent. This tent is available on Amazon. I have noticed it on several of their global stores so you will benefit from their efficient shipping service. You might want to know that the Amazon price is well below the one you can see on the manufacturer’s site. So this Wenzel Blue Ridge 7 tent is a tunnel-type tent and as such, it is not freestanding. You have to stake it first before raising it up, so choose the appropriate camping space. A sandy area will not keep the stakes, and on a rock or frozen ground you will not be able to get them in the ground. The tent is with a partial coverage fly and this allows you to have views around, there are two windows on the sides and one on the door, see the picture below. All the openings are with a dual-layer design that includes mesh and zippered panels. I like the fact that it has those zippers, this is a feature which you would normally expect only on much more expensive tents. The tent shown without fly to see its elegant structure. Capacity: They describe it as roomy, but the declared capacity is 7 people. The floor plan and the dimensions are shown below, and you see what the manufacturer suggests about using the tent floor for sleeping. 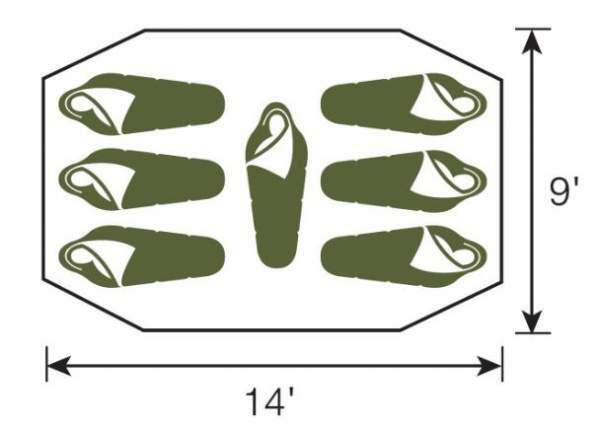 This may look reasonable but see the length of the tent which is only 427 cm, so it would be very difficult to have people sleeping as suggested. The main dimensions and suggested way of using the floor for sleeping. The actual area is 117 ft² (10.9 m²). If used by 7 people this would mean 16.7 ft² (1.55 m²) per person. So it is best to forget the option of one person sleeping in the middle as shown in the picture above, and with 6 people it would be doable. For actual camping, note that there are no storage areas, so I would say this is a tent for a maximum of four people, best suitable for parents with one or maximum 2 small kids. Note also that the suggested way of using the floor is possible only without the divider. Namely, the divider can be removed or it can be attached on either of the two sides with respect to the door, so the space is asymmetric when the divider is in place. 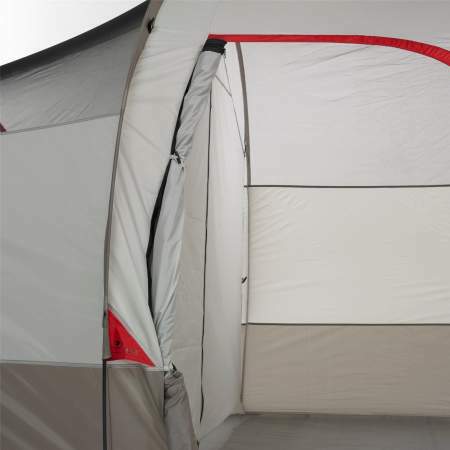 With the divider, two people can sleep transverse to the main axes of the tent (in the same direction as the user in the middle shown in the picture above). Then you have space for 2 – 3 people in the remaining bigger part of the tent. Two queen size mattresses fill fit nicely inside, there are people asking about that so just to know. Seasons-wise & climate-wise, this is a summer camping tent. The ceiling is all mesh which is good for warm weather situations but not if it is cold. Also, with such a partial fly it is best to avoid strong winds. They do not provide any info about the waterproof rating, so better do not put it to harsh tests. Weight-wise, with its 18.1 lb (8.2 kg) this is a lightweight tent. You will see how it compares with some of its competitors, there is a comparison table below. The packed size is not bad at all, so you can transport it in various ways. I already gave a few facts about its structure, here just to add that there is only one door, this may not look enough but it is large so this is not so bad. The E-cable port next to the door. Top view showing the mesh ceiling and the divider inside. You have them 5 in total, one is used for the small brim above the door and the other poles create arches for this tunnel structure. This is shock-corded fiberglass, not particularly durable pole material but you cannot expect something else for such a price. 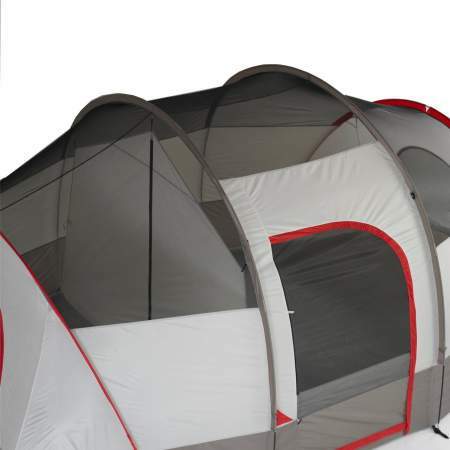 Besides, fiberglass is used also in much more expensive tents, you will see one in the comparison tabkle below. The best part is its floor which is polyethylene with welded seams. This is the standard way of sealing plastic materials and such seams are more durable than the surrounding material, so you are safe from groundwater for sure. Note that this is not a bathtub design, have seen people asking about that. 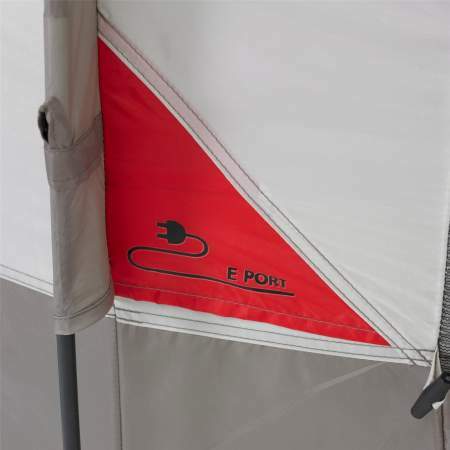 The upper body of the tent and the fly are polyester, but there is no info about the denier value or rating. The door is with a mesh window. The door rolls to the side. I already mentioned the ceiling which is all mesh, and you also have mesh on all the openings. But there are no floor vents, this is not so great if you have to keep the windows and the door with panels, and you will have to when it is raining. Though many users have confirmed that they did not have issues with ventilation. The divider is with an inverted-T shaped zipper. 8 Metal and 8 plastic stakes. Manufacturer’s limited 10-year warranty, hard to believe. It is built in two colors, but there is no difference in features. If you visit Wenzel’s site you will see the year 1887 as the start of the company. It appears that they have started with tents, so this is indeed remarkable. Buying from such a brand gives some security, so the mentioned 10-year warranty is not a surprise. Weight: 18.1 lb (8.2 kg). Dimensions: 14 x 9 ft (427 x 274 cm). Area: 117 ft² (10.9 m²). Area per person: 16.7 ft² (1.55 m²). Packed size: 28 x 8.8 x 8.8 in (71 x 22 x 22 cm). I have decided to show you this Wenzel tent side by side with two other tunnel-type tents from some renown brands, so one is 6-person and one 8-person capacity. Clearly, it is far less luxurious than the Ferrino tent but it is three times less expensive. 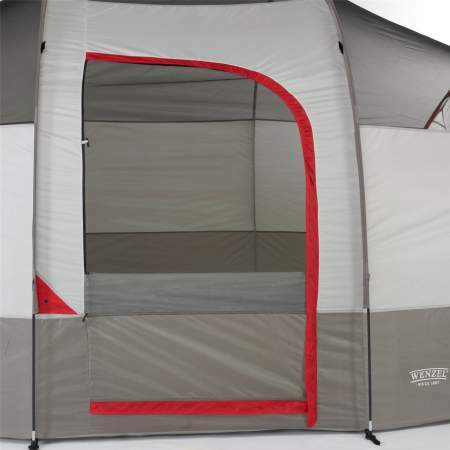 Several of its parameters are very comparable to the Slumberjack tent. Please follow the links for more details. In the summary of this Wenzel Blue Ridge 7 person tent review, I would stress that this tent has been on the market for many years already so everything is known about it. This is a budget-friendly tent but you get what you pay for. If you do not want to spend much and need a tent for occasional summer camping, there is no reason to look for something else. There are many tents here in the site so if you need more options just look around in various categories. Please note that I am not paid by the brand and I have no relation with them. There is a comment box below so please use it in the case of questions or comments.